I was blessed to get a simple link today on Twitter asking if I wanted to win a free handbag from Handbag Planet. Being the clothes and accessory horse that I am, the answer was naturally yes, but what I am now excited about is the approach they are using to launch their site. A true pro must be behind this, because it is the most well-done launch I can remember seeing in a long time. It made me think of the difference between “promotion for users” vs. “promotion for the company. When you want to sell something, it has to benefit the user or they won’t care, and your benefit almost recedes into the background. 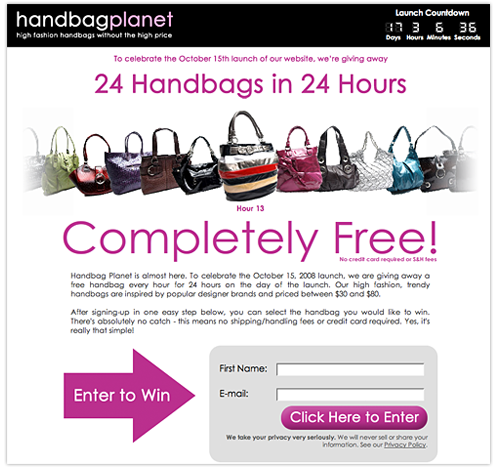 By setting this promotion up the way they have, Handbag Planet has virtually assured themselves some viral marketing and that people who love handbags will be terribly excited for the site to launch in about two weeks. I hope they will have a wide variety of merchandise to choose from, because that will be key in maintaining people’s enthusiasm. It would be really cool if they hooked up with Zappo’s and found matching shoes for these purses, and vice versa. Talk about a time saving benefit to users! I wanted to blog about this the moment I saw it, from the design and marketing perspective. But HP entices people to blog about it by offering free contest entries for the free handbag after you’ve entered. Or you can Twitter about it, or send email… it is such a great idea, and one that they have made doing simple and easy. I want you to see the design execution. In two simple pages, they utterly captivate someone like myself who loves pretty clean design, and well, purses. I bought one yesterday at the spa I went to for a mani/pedi. Admittedly, I am these people’s audience. LOL! But we should all learn from them and think about how to apply the lessons for other purposes. And then you’re pleasantly surprised by being allowed to choose your own handbag! The final step is a marketer’s dream, but I won’t give away their secret sauce by posting that screen here… sign up to see it. I really think this promotion gets an A+ for generating excitement and engaging users to become eventual customers when they launch. Well done! I only hope that the user experience of the site, and customer experience when placing an order is as nicely executed as this launch promotion. 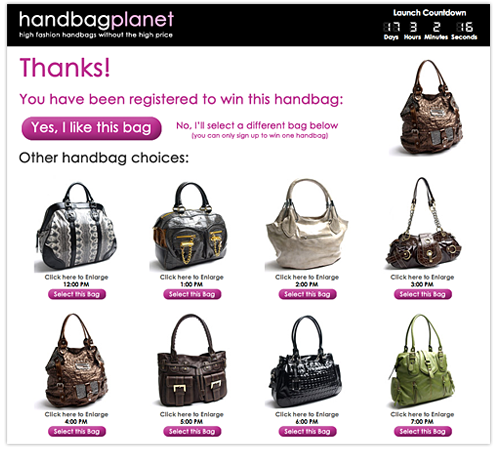 Sign up to win a free handbag and check the promo out for yourself! I noticed this site has already been scrapped (more or less) and merged with another site. Any way you will expand on what the last page of the sign up process was since we can no longer access it? Oh, yes, you’re right – now that the promo is over, it cannot be seen by signing up. I know the designer (we follow each other on Twitter) – I will see if he has a screenshot of it that we can have here or not. Basically, if I remember correctly, the final page was a social media promo, where you could tweet info on this promotion, or email it, or blog about it, and you got more entries into the handbag promo. It was VERY well done, because it was designed so well that it made it hard NOT to go ahead and share it with someone else in one of these ways. I’ll see if he can share the last screen or not – he knows about this post! Hello, I’m the Director of Technology for One Click Internet Ventures, the owners of Handbag Planet (now Handbag Heaven). We had such success with the contest that we acquired a more established website to speed our push into the handbag market. I’ll provide Kristi with a screenshot of the last page. Thanks! Some very interesting and insightful thoughts. I like this. Product promotions is just one type of marketing technique. What will be the most successful in the “bag” promotion, is when the winner of the bag gets to use it, touch it, feel it, and decided whether or not the product is great. More then product promotion or event marketing, we are starting to come to the age of AdverTrying (read more at http://www.advertrying.com). Where placing the product in the consumer’s hands, outside the store setting (such as on vacation, resorts, in-flight, etc) is really allowing the customer time to engage with the product. It’s the relaxed dwell time a customer has with a product that allows them the time to connect and decide to a brand fan. The true test of the bag’s brand will be upon arrival of the recipient’s hands.